For safety and convenience, the Finn Bear comes with a deep pouch style Cor-Ex sheath and generously sized belt loop so it can be worn on the waist, slung around the neck or tossed into a duffle bag or tackle box. We have used several Finnbears for hunting and fishing in Alaska, great little knife does an outstanding job on the biggest of big game. 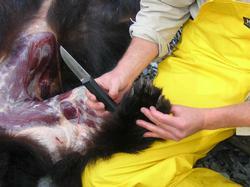 Above are some photos of a Finnbear used to skin an Alaskan Black Bear, no sharpening needed. This is a simple rugged knife! We offer our own, all leather sheaths starting at $25. I carry a Finnbear on my own Chesty Puller Straps when in the outdoors.